NATIONAL COALITION OF 100 BLACK WOMEN - Decatur-Dekalb Chapter, Inc. Welcome to National Coalition of 100 Black Women (NCBW) - Decatur-Dekalb Chapter, Inc.
Signature Event: Pink & Black Ball November 4th, 2017. 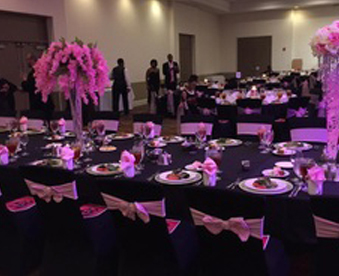 The Annual Pink and Black Ball is the signature event of the Decatur-DeKalb Chapter. In 2003, then president Pamela Stephenson created the Pink & Black Ball as a way to recognize breast cancer survivors and advocates for their work in the community. The event is also used to raise funding for The Legacy Program through the Silent Auction and a portion of all funds is donated to the American Cancer Society. The color pink and the pink ribbon is recognized as the national symbol of breast cancer awareness. The color black represents women of color standing together in the fight against breast cancer. The color pink and the pink ribbon is recognized as the national symbol of breast cancer awareness. The color black represents women of color standing together in the fight against breast cancer. In the fight against cancer, the Decatur-DeKalb chapter is working to educate our community regarding the importance of lifestyle choices, early detection, and treatment.